Pryor Mountain Mustangs are a substrain of Mustang considered to be genetically unique and one of the few strains of horses verified by DNA analysis to be descended from the original Colonial Spanish Horses brought to the Americas by the Spanish. They live on the Pryor Mountains Wild Horse Range located in the Pryor Mountains of Montana and Wyoming in the United States, and are the only Mustang herds remaining in Montana. They are protected by the Wild and Free-Roaming Horses and Burros Act of 1971 (WFRHBA) and managed by the Bureau of Land Management (BLM), who has set the optimum herd number at 120 animals. Genetic studies have revealed that the herd exhibits a high degree of genetic diversity and a low degree of inbreeding, and BLM has acknowledged the genetic uniqueness of the herd. 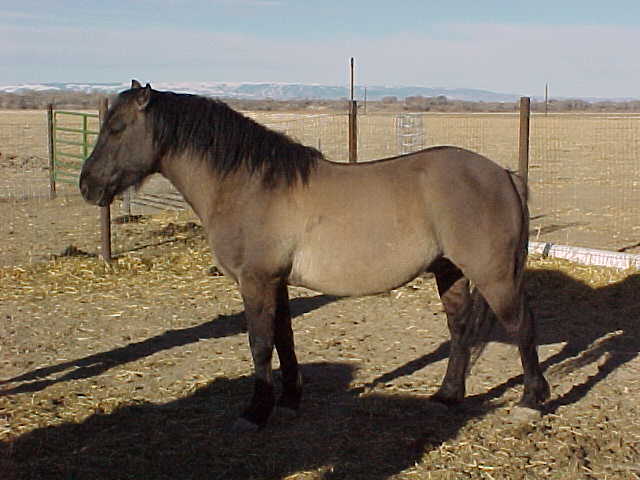 Pryor Mountain Mustangs are relatively small horses, exhibit a natural ambling gait, and domesticated Pryor Mountain Mustangs are known for their strength, sure-footedness and stamina. Feral horses are documented as living in the Pryor Mountains by the early 1700s, although they may have been there since the late 1600s. By the late 1800s, thousands of feral horses inhabited the area. In the early 1900s, many of the unbranded horses were rounded up, to allow domesticated livestock to graze the range without competition, and by 1964 there were only around 200 horses left. In 1964, the BLM announced that the horses would be removed altogether, to the outrage of the public. The controversy continued until 1968, when the BLM was legally stopped from removing all of the horses, and the area declared a Wild Horse Refuge. After the 1971 signing of the WFRHBA, the BLM spent the 1980s and 1990s conducting population studies and developing management and adoption policies; during this time, numerous genetic studies were also completed. The BLM management of the herd has included improvements to the range to give the horses additional access to water, and numerous roundups that have resulted in the removal and adoption of hundreds of horses to private individuals, including over 50 horses in 2009, and another 44 in 2012. In 2015, a plan was approved to gather 6-12 one and two year old horses annually until the contraceptive vaccine the mares are given can lower birth rates more. This resulted in the most recent gather and removal of 17 horses and 1 foal. Once again, every horse captured was adopted. The Pryor Mountains Wild Horse Range is one of the most accessible areas to view feral horse herds in the United States and tourism to the area has increased in recent years.